(Fort Wayne, Ind.) – A new project being launched this week by Allen Superior Court will provide a powerful new tool for families, parents and guardians struggling with substance abuse. 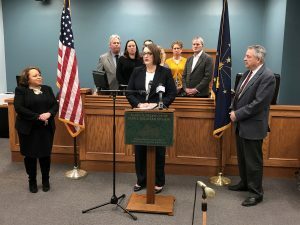 Family Recovery Court (FRC), funded through a $15,400 grant from the Indiana Supreme Court and operated by Superior Court’s Family Relations Division, will begin hearing cases on Thursday (Feb. 14, 2019). Allen County’s FRC will become only the eighth certified Family Recovery Court in Indiana. Last year, 749 CHINS (Children In Need Of Services) cases were filed in Allen Superior Court. In 2017, that number was even higher, with 818 cases filed. Each of those cases involves allegations of abuse and neglect against one or more of a child’s parents or guardians. It is estimated that 85% of CHINS cases involve parents or guardians struggling with drug addiction. A CHINS case is filed by the Department of Child Services. A family will be accepted into Family Recovery Court after the children have been found by the Court to be children in need of services and a final order stating such has been entered. The Family Recovery Court will serve parents and others in a child’s life whose substance abuse issues are the most severe and central to the reasons why their families have entered the court system. Clientele could include one or both parents, family members, guardians or custodians. Under a traditional model, families involved in CHINS matters come to court as infrequently as every six months. Because of the infrequent supervision, families struggling with substance abuse might take too long to get enrolled and engaged in drug treatment services. Infrequent supervision is especially problematic in light of the multiple issues faced by the majority of FRC participants, such as domestic violence, mental health issues, homelessness, unemployment and lack of healthy support systems. Under the FRC model, parents and others involved in a CHINS case with substance abuse issues are seen before a judicial officer on a weekly, bi-weekly or monthly basis, depending on what stage of recovery they are in. Allen County FRC cases will be heard primarily by Magistrate Sherry Hartzler. The new court will collaborate with community partners to provide addiction treatment, mental health, education and health care. Team members can include the judge or magistrate, public defender, the Indiana Department of Child Services, guardians ad litem, and treatment and service providers. Entry into Family Recovery Court is voluntary. Such courts have been proven to reduce the time children are placed outside the home in CHINS matters. They are also proven to prevent removals in some cases. There are currently eight other Family Recovery Courts operating in Indiana. Allen County modeled its court on one run by Grant County Judge Dana Kenworthy. 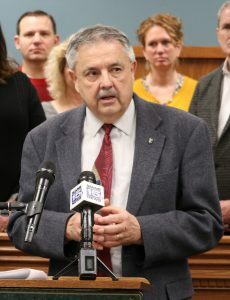 Family Recovery Courts have gained momentum in Indiana as a result of the Indiana Supreme Court’s support of the problem-solving court model. 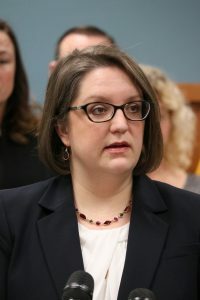 Indiana Chief Justice Loretta Rush calls the courts, “imperative to address the addictions crisis” and appreciates the work of trial courts that are creating a “path for parents with addiction to work toward safe reunification with their children.” Allen County’s FRC has already received provisional certification by the Indiana Office of Court Services. The Supreme Court grant will pay for training, participant incentives, data collection and other activities. The grant runs through September 30, 2019. 2019 © Allen Superior Court. All Rights Reserved. Web Development by PH Digital. Disclaimer: These pages were created to provide valuable information, forms, and various resources in regards to the operation of the Allen Superior Court Family Relations Division. Material presented on these pages is intended for information purposes only. It is not intended as professional and/or legal advice and should not be construed as such. Some links within these pages may lead to other sites. Allen Superior Court does not necessarily sponsor, endorse or otherwise approve of the materials appearing in such site.